This is a professional cutting tool with strong power, wide range of use and long service life. 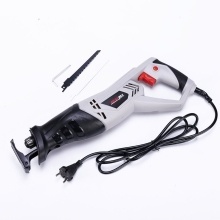 It is a must-have power tool for families and industry. Pure copper motor, strong power, more stable performance. With anti-self-locking switch, which can ensure the safety in use. Wide range of applications, can saw wood, plastic, iron sheet and so on. Compact and portable, the handle is shockproof and non-slip.